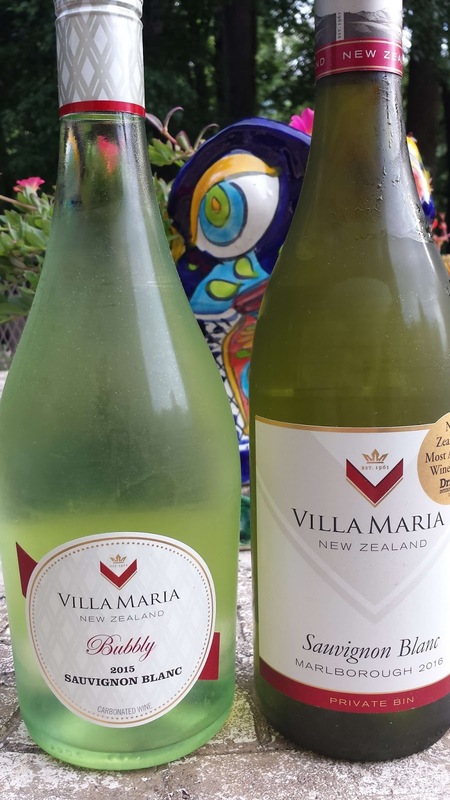 One of the most reliable sources for affordable New Zealand Sauvignon Blanc has always been Villa Maria and they didn't disappoint with their current summer offerings tasted through the #FirstSipNZ campaign. Elizabeth Smith has the details on this campaign at Villa Maria’s First Sip of Summer. In general New Zealand, and in particular, Marlborough Sauvignon Blanc wines are fresh; driven by citrus, tropical, herbaceous, and mineral characteristics; and refreshingly acidic. I learned that the "minerality often comes from vineyards with stony old riverbed vineyard sites". Here are the two wines we sampled, both will be available across the U.S. either now or towards August. Cheers. 2016 Villa Maria Private Bin Sauvignon Blanc (SRP $14.99). The grapes were sourced from vineyards throughout the Marlborough region of NZ with a mixture of warmer and cooler vineyard sites which showcase the herbal and tropical note. However, for me, this wine was all citrus from the wet grass aroma through the bright lemon-grapefruit character to the long, long finish. 2015 Villa Maria Private Bin Bubbly Sauvignon Blanc (SRP $14.99). Produced in the frizzante style similar to Moscato d’Asti and Vinho Verde where the wine maintains generous effervescence but not to the extent of a sparkling wine. According to winemaker Helen Morrison, a true méthode champenoise would overwhelm Sauvignon Blanc and the wine would lose the freshness associated with the grape. The grapes were also sourced from vineyards throughout the Marlborough region of NZ. The added frizz elevates the fruit profile with the citrus flavors dominating while chilled and the tropical banana and guava like characteristics evolving when warming.. The wine also maintains its texture from the creamy start to effervescent ending. As for food pairings, seafood was highly recommended (mussels in particular). I'll be heading to the beach with this wine for sure.